You will often hear dental implants spoken about in very glowing terms, with strong implications that implants are some sort of miracle treatment. While it’s true that implants provide a very advanced method of permanent tooth replacement, like any other dental work, certain precautions need to be taken to ensure that the implants are well taken care of, so that they can last as long as possible. The first thing you can do to reduce the risk of problems with dental implants comes long before you have the procedure done. Make sure that you are in good general health and that you are a non-smoker. 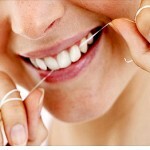 You should eat a balanced diet, and of course follow a strict and regular oral hygiene routine. Following healthy practices can greatly reduce the risk of your implants not “taking” properly. Good dental hygiene is also important after your surgery. Your implants will need to be brushed and flossed just as if they were natural teeth, and you will need to be vigilant about keeping your gums healthy. Grinding or clenching your teeth can greatly increase the risk that your implant will fail. Grinding puts a huge amount of unnecessary pressure on the teeth, and if you have an implant that is healing, you can either break the implant or cause it to move around. One problem is that people who grind their teeth at night may not even be aware that they are doing it, though signs will be there that the dentist can see. When you come in for your dental appointment, if it appears you grind your teeth, that issue will need to be dealt with first to increase the likelihood that your implants will be successful. Luckily there are some complications with traditional tooth replacement solutions that simply aren’t an issue with implants. For example, you will never have to worry about the problems associated with a poorly-fitting denture. You will not have to worry about losing your teeth while talking or eating, nor will you need to remove your teeth at night. Implants that are properly taken care of will look and behave like your natural teeth, and will last many years or even decades. If you are concerned about your risk factors, or if you are diabetic or a smoker, come in for an initial assessment and get some advice on the best way to proceed. The sooner you get professional advice, the sooner your smile can be restored in every sense of the word.